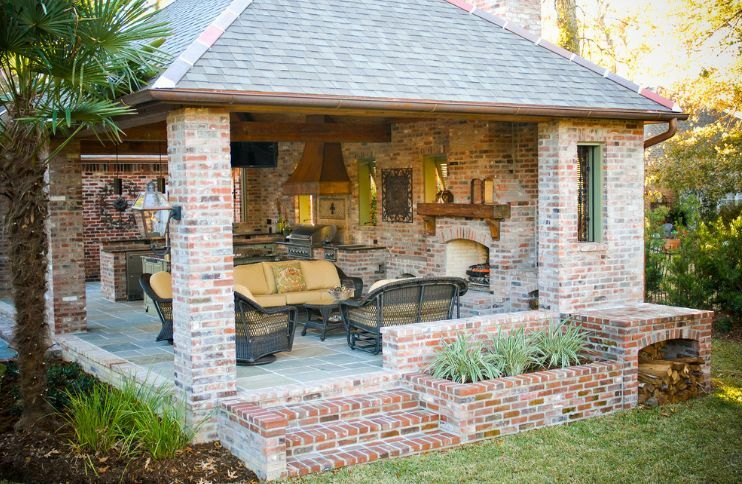 Brick patios are easy to install but you have to make sure you lay them flat and uniform. There are numerous strategies you can use in order to ensure that. 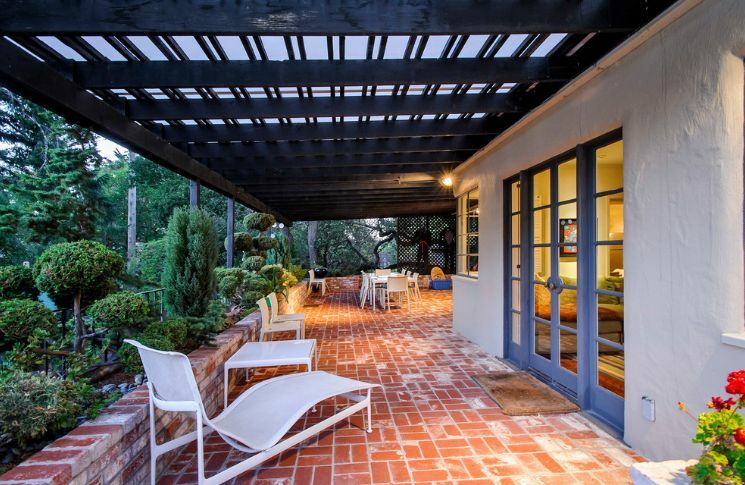 For example, it would be easier to work with brick-like concrete pavers than with traditional bricks. Concrete pavers are harder and less likely to crack than clay bricks and this makes them a more practical choice. 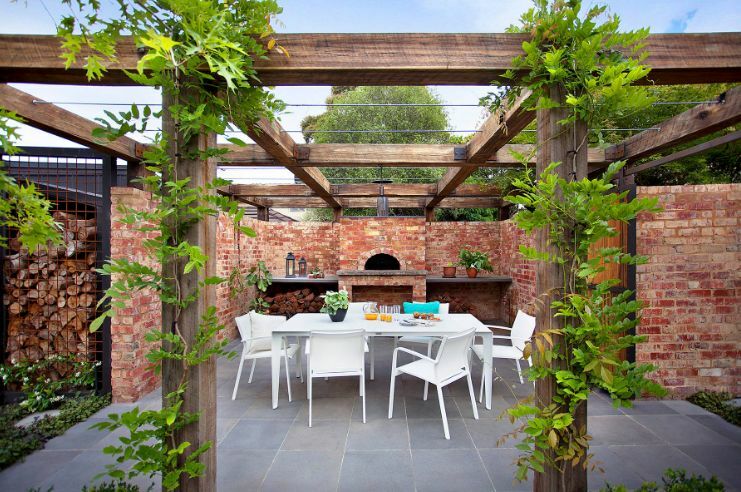 However, if you’re aiming for an authentic and rustic look, clay bricks can prove to be better for the job. Look at several different examples and analuze the pros and cons before making a decision. It’s usually a good idea to build a solid border around the patio in order to make sure it doesn’t spread or lose integrity over time. The border can be made of landscaping timber, concrete and a variety of other materials. 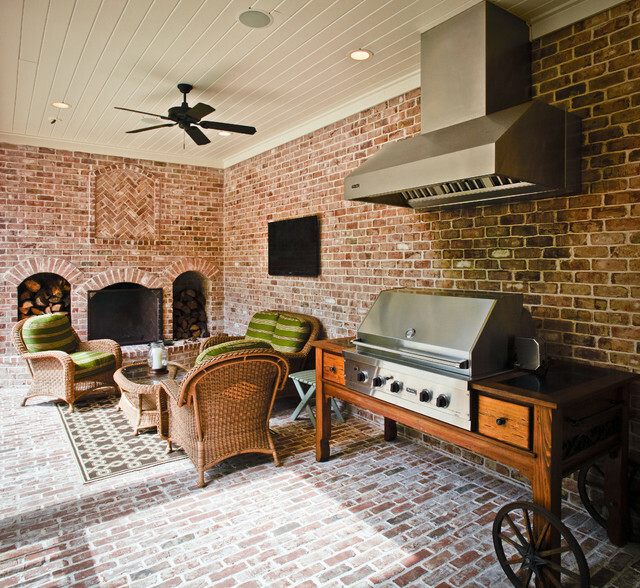 There are two main options when it comes to installing a brick patio. One is flexible pavement. This is the quickest and easiest method of the two so if you’re looking for functionality and a way to save time and effort, this is the best idea. When installing flexible pavement, the pavers are laid directly onto a bed of crushed stone or compacted sand. This saves time and effort and makes the process faster and easier. The second option is mortared pavement. In this case, the crushed stone base is topped with a concrete slab. It’s a more difficult process which requires more time. It’s difficult to get the surface leveled this way. Now that you know a little bit about the methods which can be used, let’s get to the actual process. Before anything else, you need to define the perimeter. 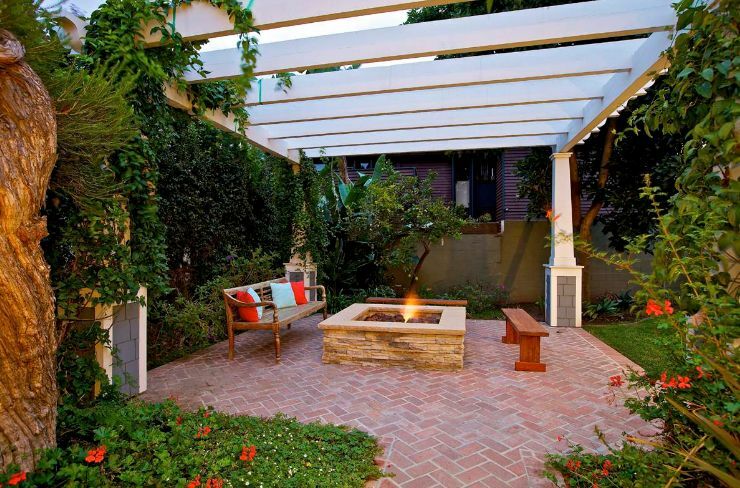 So figure out where you want your brick patio to be placed and what shape and size it should have. Use strings to create this outline and be as precise as possible. Then comes the next step. You need to dig a trench around the perimeter and to lay down the solid edge if you want one. Put down a layer of crushed granite and compact it. Although you can also use sand instead of crushed stone, this is a better option if you want a stronger and more stable base. After that, add another layer. You can then add a layer of landscaping fabric over the crushed granite. This will prevent grass and plants from growing between the bricks or pavers. Your patio will be weed-free and will stay that way for a very long time. It’s then time to start arranging the bricks. Start from a corner and decide what pattern you want to use. The basket-weave pattern is one of the most popular. It’s done by alternating right-angle pairs of bricks, two by two. 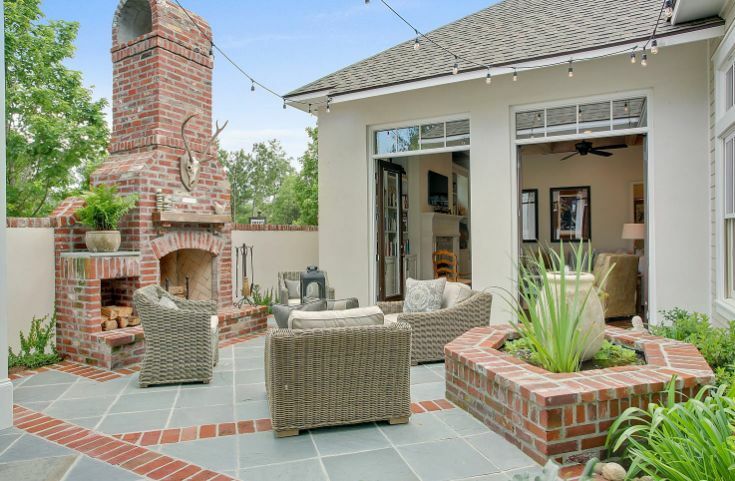 Of course, you can choose a different pattern, one that batter matches the outer walls of your house or other design elements present in the proximity of your new brick patio. If you want the patio to have stairs or to be elevated, then you need to take the necessary measures before you start laying down the bricks or pavers. 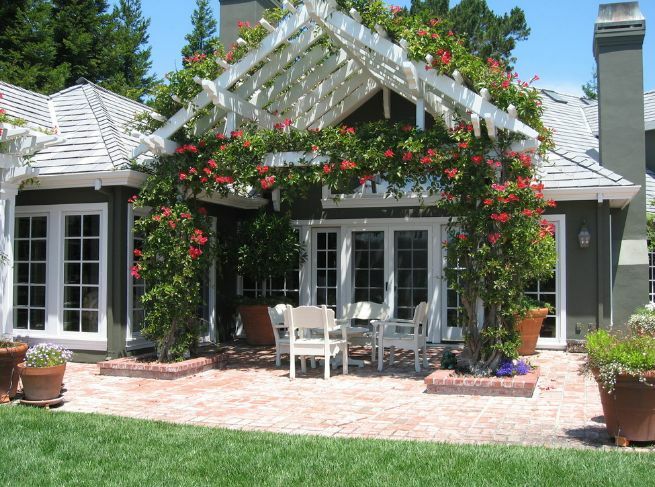 You can use this strategy if, for example, you’re building the patio of a sloped surface. 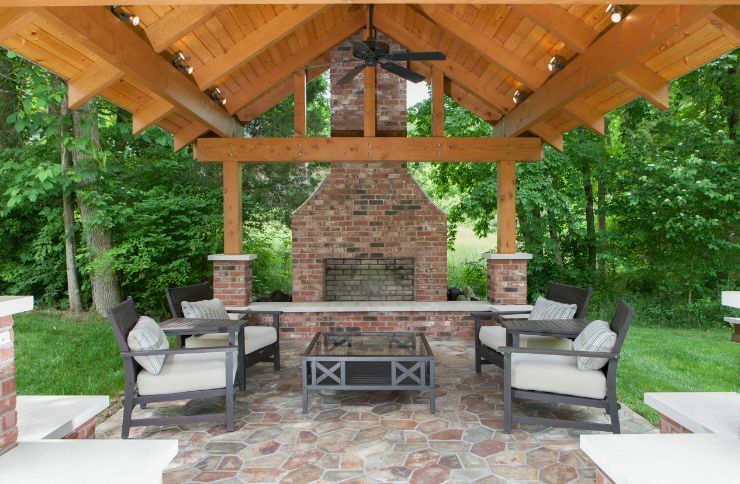 Your brick patio can include an outdoor fireplace which can also be built using clay bricks or whatever you’re using for the patio. The result will be a cohesive design which usually suits well traditional and rustic homes. 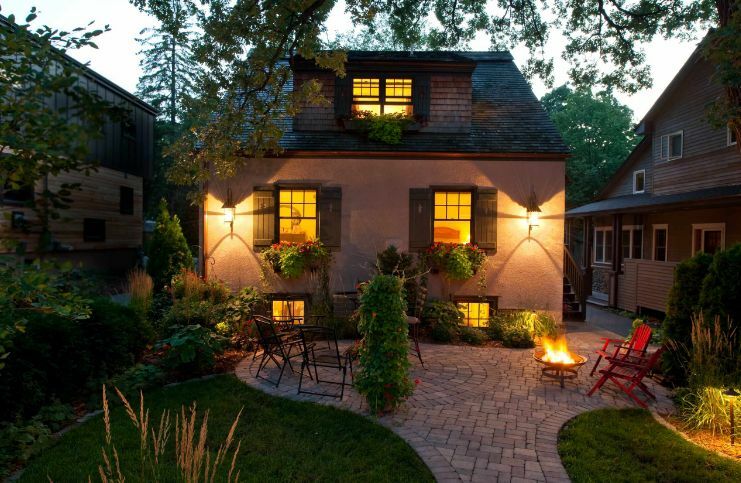 The patio can actually also match the house itself if it was built with brick exterior walls. 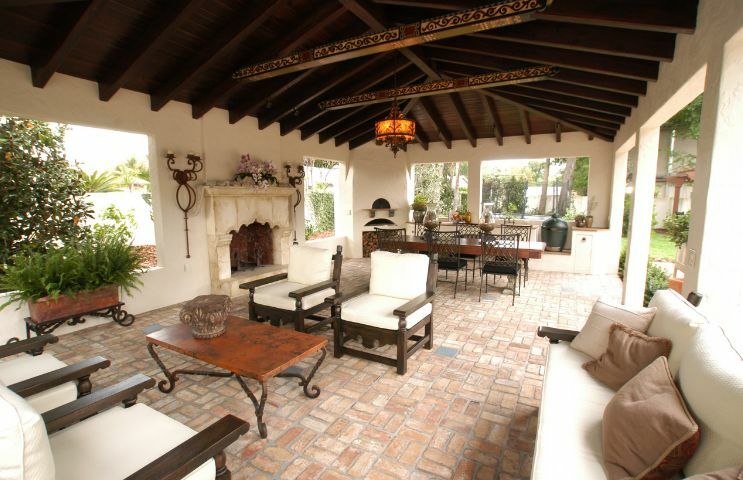 Check out this traditional patio and how it perfectly matches the house, its style and overall design. Bricks can be used to build all sorts of things. 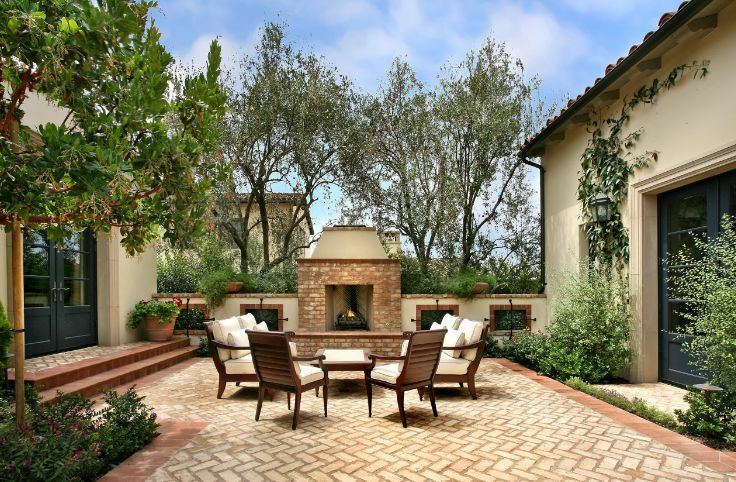 Outdoor fireplaces are one of the options. They don’t necessarily have to match the floor of the patio. 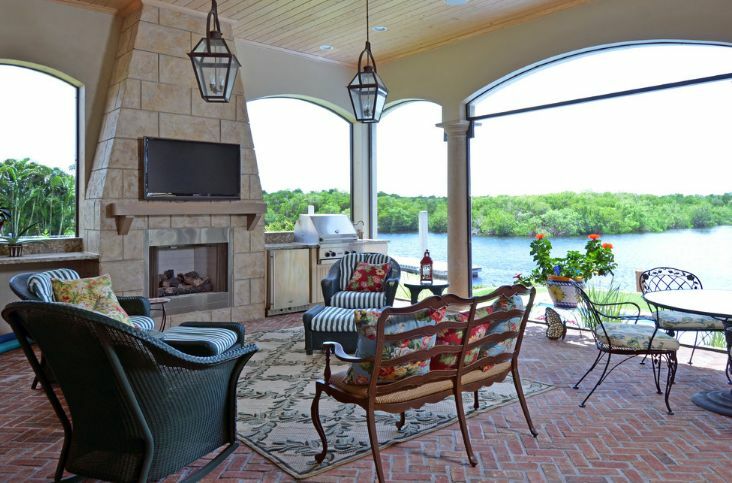 For example, you can have a stone floor and a brick fireplace. 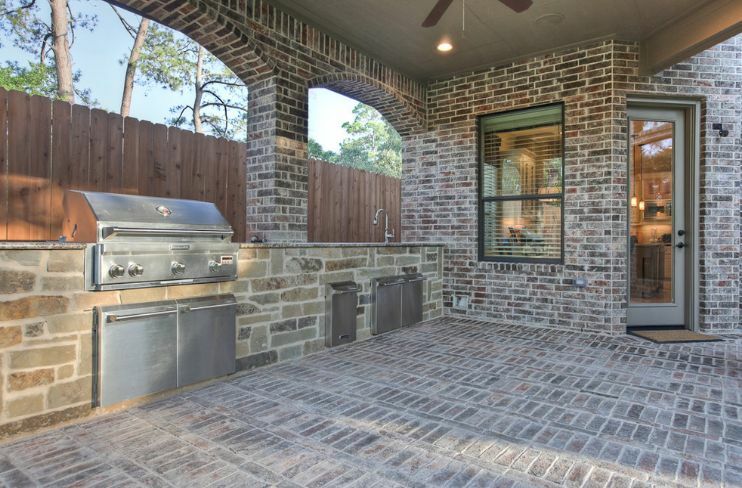 Here’s another example of a pretty impressive outdoor fireplace/ oven. 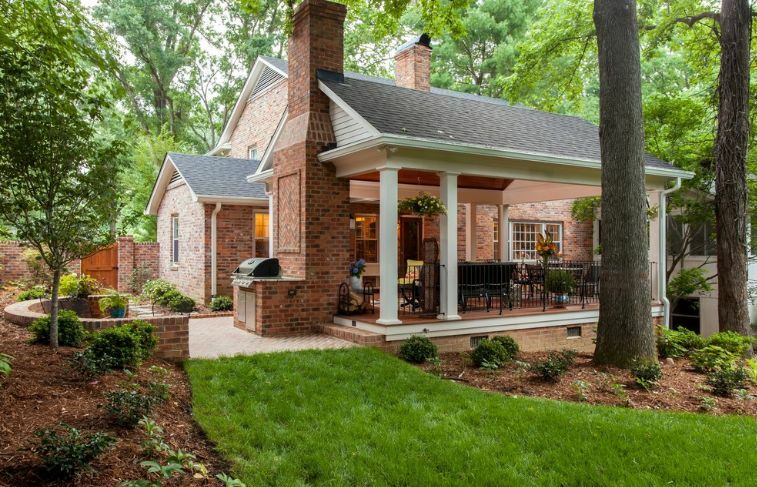 This one matches the brick planter and some of the details on the patio floor. The style is eclectic, somewhere between rustic and modern. 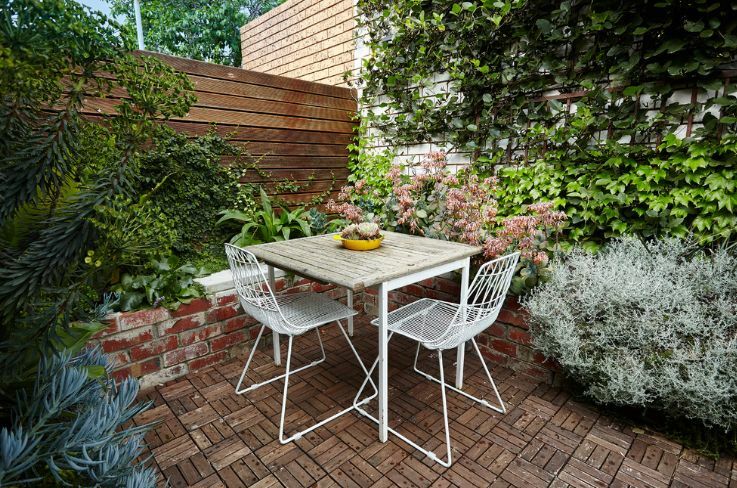 Another interesting idea is to combine a tiled patio floor with brick walls or fences. It would definitely be an interesting combination and a way to highlight the strong contrasts between the materials, their textures and colors. It’s a look that suits eclectic spaces so consider it for a modern patio that needs a little bit of rustic flair and warmth.